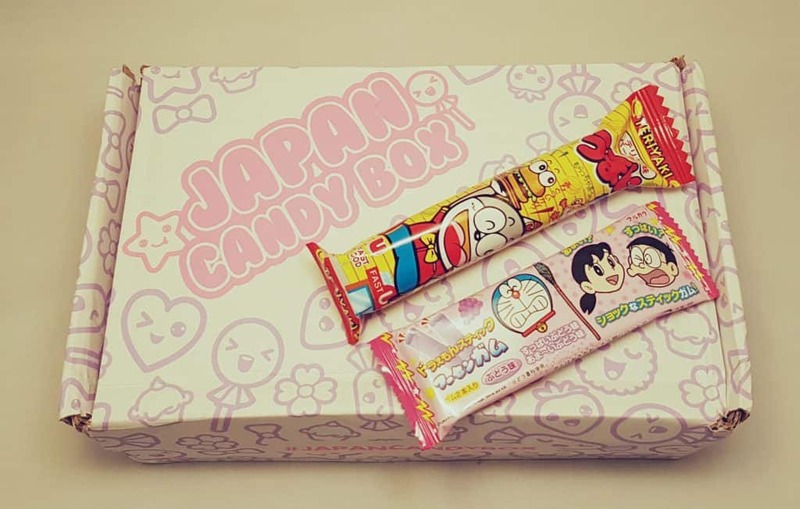 Japan Candy Box is a monthly subscription box full of 8 – 10 quirky and fun Japanese candies. 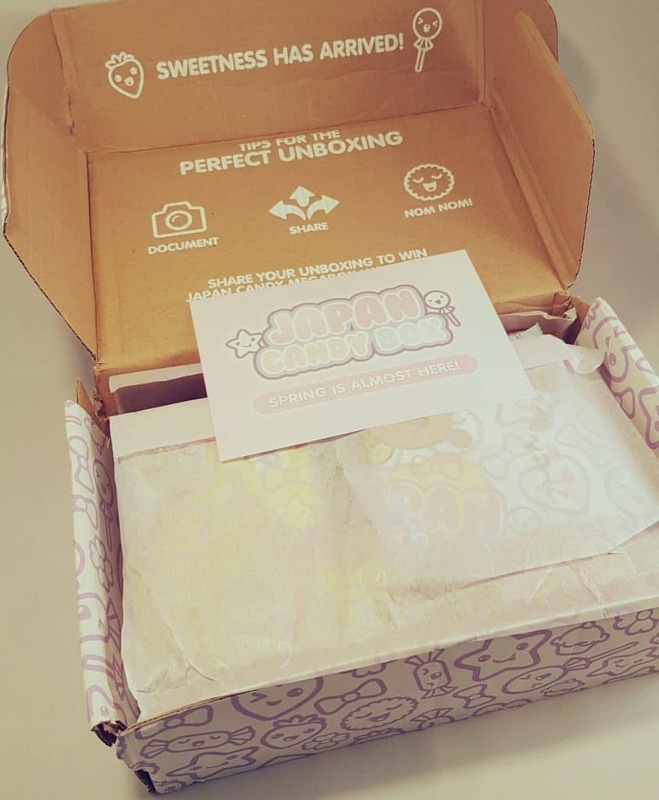 It is also the sister company to the lovely Kawaii Box, which I reviewed here. 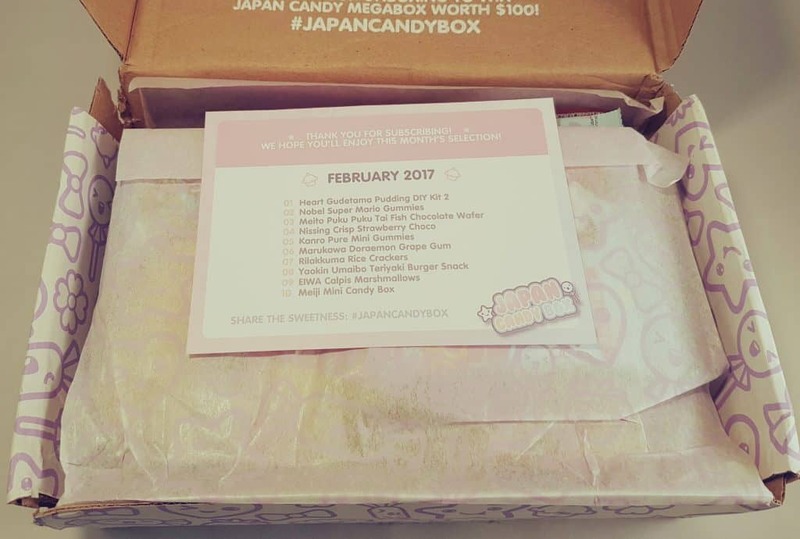 Anyway, I was sent February’s box. 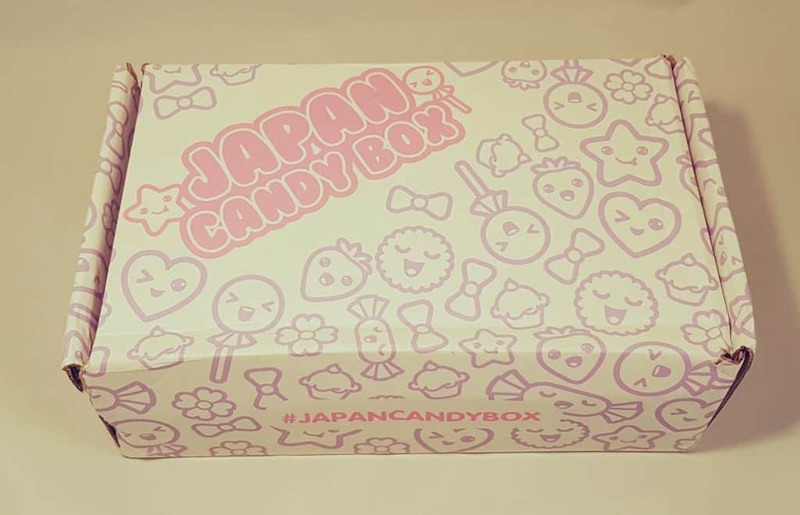 Like the Kawaii Box, the box was slightly squashed. Again, nothing was damaged, and it weighed very little so I’m sure light packages get thrown around pretty carelessly, but I think their boxes might not be as sturdy as they could be. 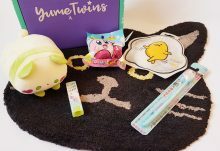 The branding is very similar to the Kawaii Box, with the same cute pink and white colour scheme and branded tissue wrapping inside. There are also flyers with cross-promotional discount offers, and of course, a menu. As always I didn’t look at the menu right away, as I like to get my first impressions from the contents themselves. Having said that, I don’t understand Japanese, while some of the candies had English on them, having admired all the cute packages I needed the menu to figure out what a lot of the items actually were! Opening it up, lots of brightly coloured things, plus a definite hint of kawaii! 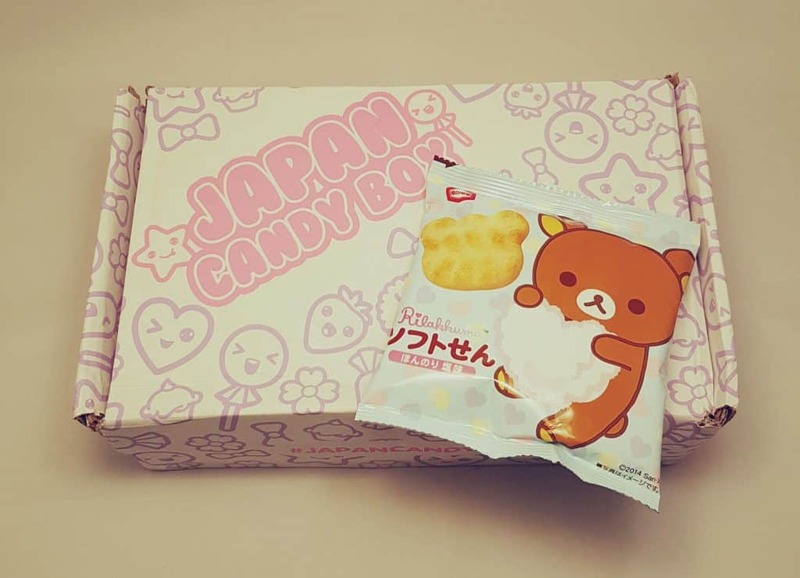 These cute teddies are called Rilakkuma Rice Crackers. They are actually more savory than sweet, but super cute and snacky. 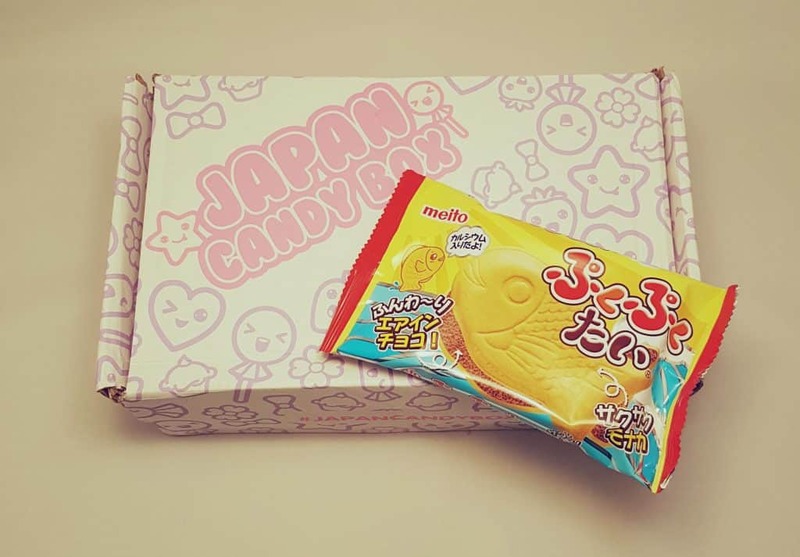 Meito Puku Puku Tai Chocolate Wafer. This was delicious, very light, with wafer on the outside and a very light bubbly chocolate filling. My daughter and I shared it, and it was a hit! 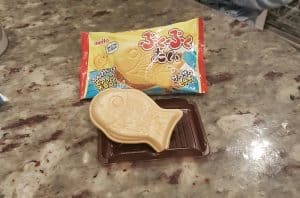 It’s a little strange to eat something sweet in the shape of a fish, but it was cute as well as yummy. Next up, two little packages. On the left, Meiji Mini Candy box (also labelled Chocolate Marbles). These are chocolate with a candy shell, exactly like Smarties. I will be handing these on to Big C, as I don’t like Smarties or similar. On the right, as you can see, Pure Lemon gummies. My favourite thing about these is the package, though they are very lemony, with kind of a slightly sour powdery coating. Top: Yaokin Umaibo Teriyaki Burger Snack. This was the second savory item, and it’s a kind of crunchy corn stick that tastes (sort of) like a teriyaki burger. Odd but nice. And once again cool packaging! Bottom: Marukawa Doraemon Grape Gum. I always associate grape flavour with American candy, but I guess it’s big in Japan too! This is sweet and sour chewing gum, which I guess accounts for the two faces on the package! I love the face the boy is pulling, I’m guessing he just got the sour flavour coming through! I love sour stuff though, so I didn’t pull that face. Now, having searched through my picture gallery I’ve just realised that I totally failed to take pictures of two of the items. I have no idea why. I can tell you they are EIWA Calpis Marshmallows and Nobel Super Mario Gummies. They are included in the main picture, but just not individually. Mea culpa. Anyway, to explain what they are, the Super Mario Gummies are pretty self explanatory. As it happens, there are several companies which make this type of gummy, but these are Japanese ones, are red and blue, and are flavoured with cola and a type of Japanese soda. So not like the Western brands. As for the Calpis marshmallows, I’ve actually saved these for my best friend, who is half Japanese and adores Calpis. Calpis itself is sort of like a milk soda pop. It’s a fermented milk beverage, kind of sweet, and very distinctive. It’s very difficult to find in the UK (I’ve seen it in Chinatown a couple times), which is why I thought my beautiful friend would appreciate the candy. The packaging is blue and white, and again, very distinctive. 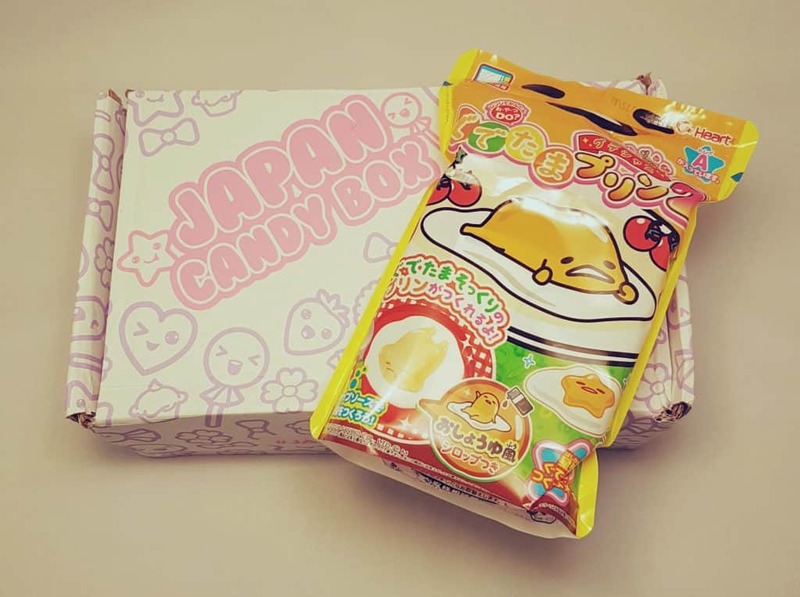 The Heart Gudetama Pudding DIY Kit 2. This little DIY candy/pudding kits are big in Japan, and there are a ton of YouTube videos devoted to them. This one is the character Gudetama, the unmotivated egg. Seriously. I’m sure you can see from the expression on his face just how unmotivated he is. And kind of miserable too. Though if you’re going to be eaten as pudding you’re unlikely to be motivated to do much. Anyway, my daughter was extremely keen to try this out. (Who am I kidding, she was extremely keen to tear into and eat every single one of the items in the box!) So we did. 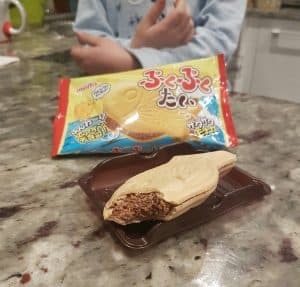 The package contained three little packets plus a plastic mould. The instructions were all in Japanese, and though there were some little pictograms they weren’t enough on their own. So I hit YouTube and we found a tutorial in English of this exact pudding. It made me very happy people are into making videos of this kind of thing. 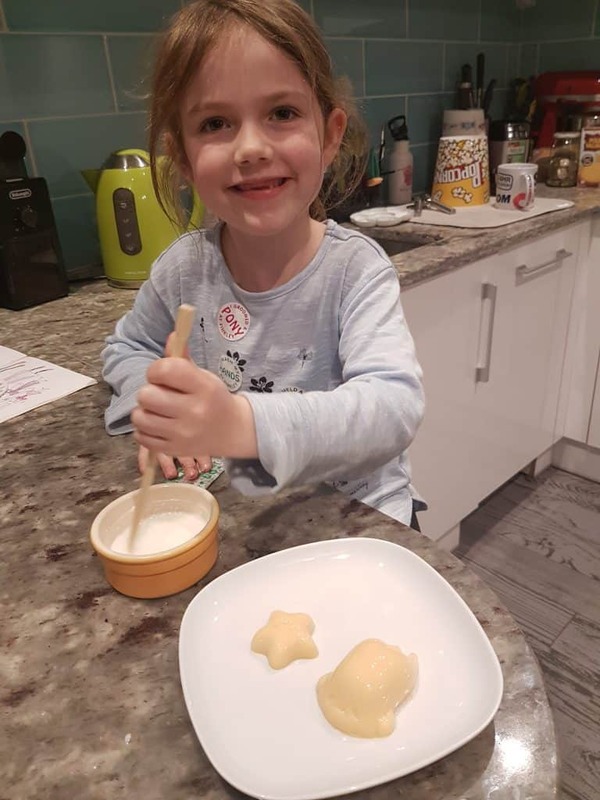 You had to provide your own milk (there was a very convenient measuring indentation in the mould, so no measuring cup needed), which you mixed with one of the packages and then microwaved. Then you poured it into the moulds and put it in the fridge to set. These would be your ‘yolks’. 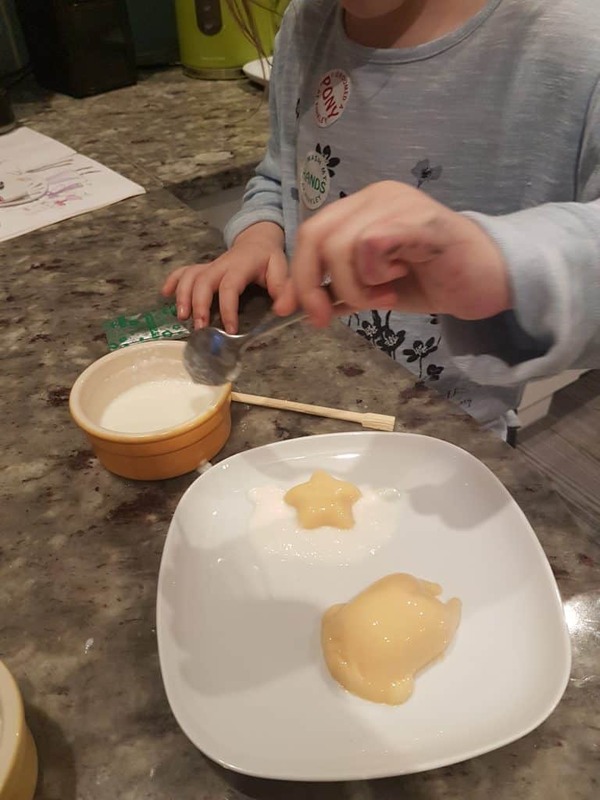 When it was set, you turned out the moulds, mixed up another little package, which would provide the ‘white’, and poured it around the yolk part. And voila! Boy, he does look kind of miserable huh? As does his little star buddy. Anyway, we were both pretty eager to try this pudding. The yellow part was kind of like vanilla pudding, or very firm custard. The white part was just sweet. I wasn’t bothered about that bit, but I liked the yolk. Little C couldn’t stand it. But then she doesn’t like cold custard at all, so it’s hardly surprising. Which is why I mollified her with the chocolate wafer fish, which as I said, she loved. So, here are my thoughts. I’ll get the value stuff over with first. Subscriptions come in one-, three-, six-, and 12-month options. They are priced in US dollars, and cost $19.90 for the one and three months, $18.90 for six, and $18.20 for 12. At current exchange rates this is £16.27, £15.45, and £14.88. Shipping is free. 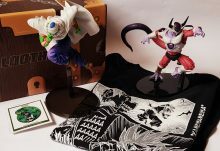 Having done some fiddling around on the internet, it’s possible to order all these bits and pieces one way or another, plus there will probably be a few UK stores which sell at least some of them. A couple of the things, such as the chocolate marbles and rice crackers, only come in multipacks, so you would have to buy in larger quantities. While you won’t save a ton of money against buying individually, you’d certainly save an awful lot of time! It’s likely you’d break even, so ordering like this is a matter of convenience and the fun of the surprise. As to the box and contents in general, I really like it. 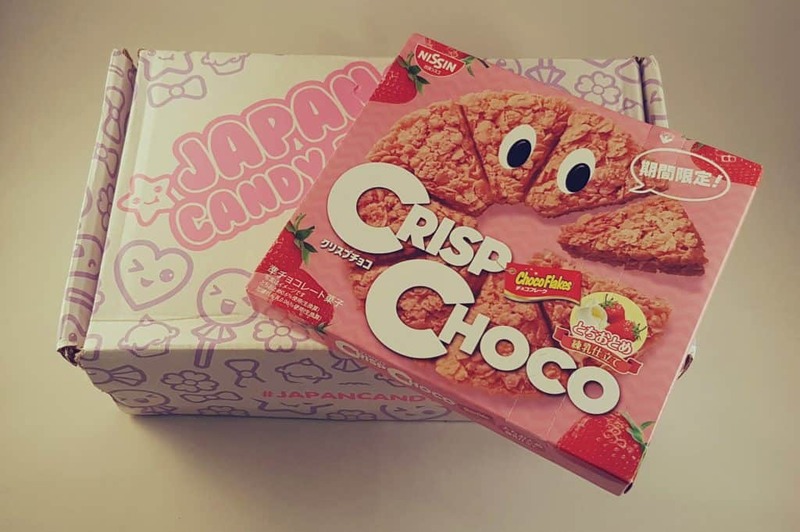 First of all, Japanese packaging is great, I love all the bright colours and cute characters, and a lot of the flavours are not at all common in the West. There weren’t any in this particular box, but I’ve heard that in Japan KitKats come in all kinds of weird and wonderful flavours, such a green tea, and I’d love to try those! 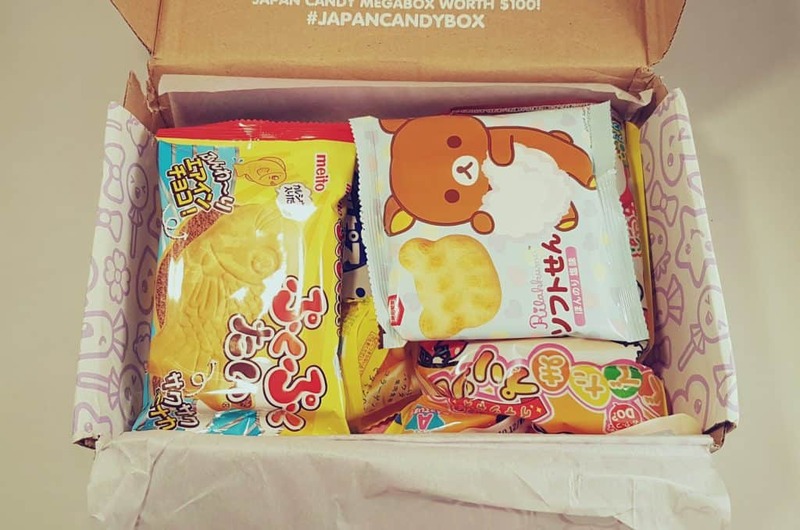 I was pleased that a couple of savoury items were included, because even though it’s a candy box, I think that savoury snacks are an entirely legitimate addition. There was a great variety of candy too, lots of different flavours and textures. The DIY kit was especially welcome, because not only are they unique, you feel like you’re working for one of your treats! 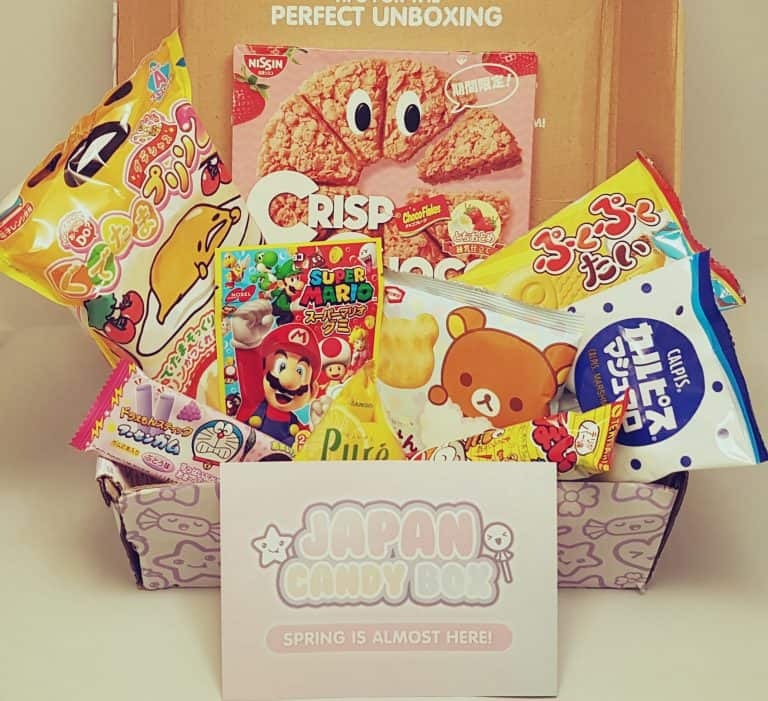 If you’re missing Japan, are particularly keen on trying new sweet (and savory) snacks from a very different culture and country, or simply want to give your sweet tooth a slightly unusual treat, this subscription is fantastic. 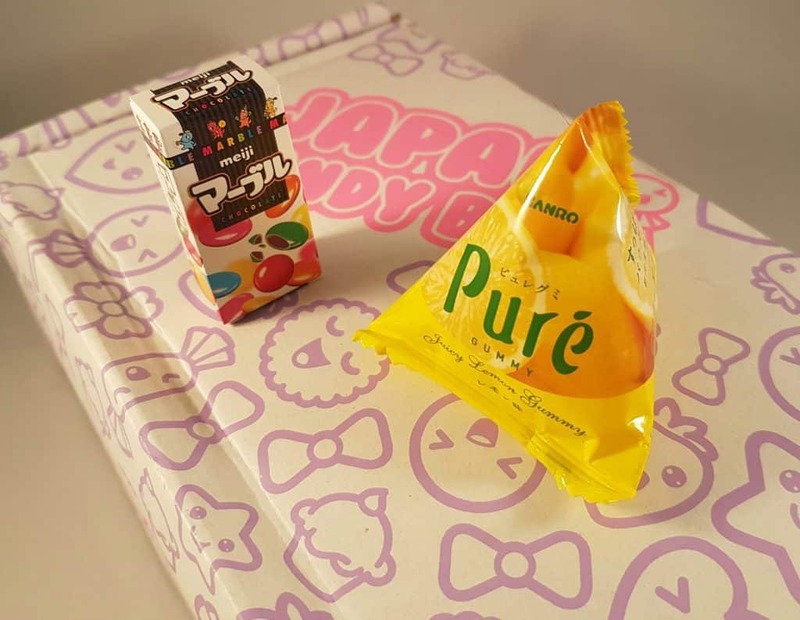 As I said for the Kawaii Box, it is reasonable enough to give as a fun gift or source of unusual party-bag or stocking fillers. 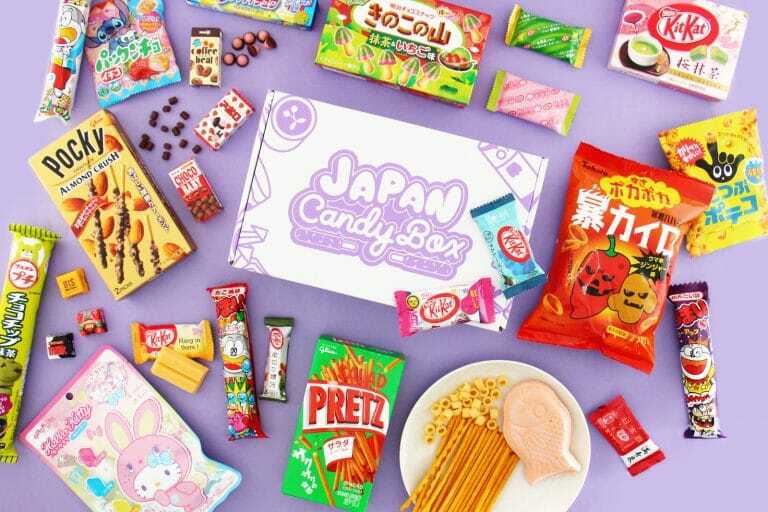 You could even throw a ‘Japanese Candy Tasting’ Party! 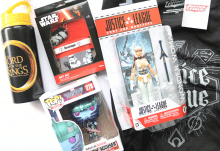 The value is perfectly reasonable, and quite aside from trying new things, all those cute packages made me smile! 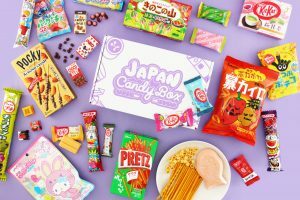 How would you rate Japan Candy Box ?